The end time, a doomsday described in many different religions, isn't a subject typically explored by massively multiplayer online games, which is a bit surprising. Depending on which religion you look to for inspiration, a game based on the end of the world could include zombies, demons, supernatural phenomenon and could even take place in the next couple of years. So I suppose it isn't surprising that the still undated Funcom massively multiplayer online role-playing game The Secret World taps into the theoretical, theological end of everything we know. And the best part: It has real, honest-to-god zombies. Not infected people. 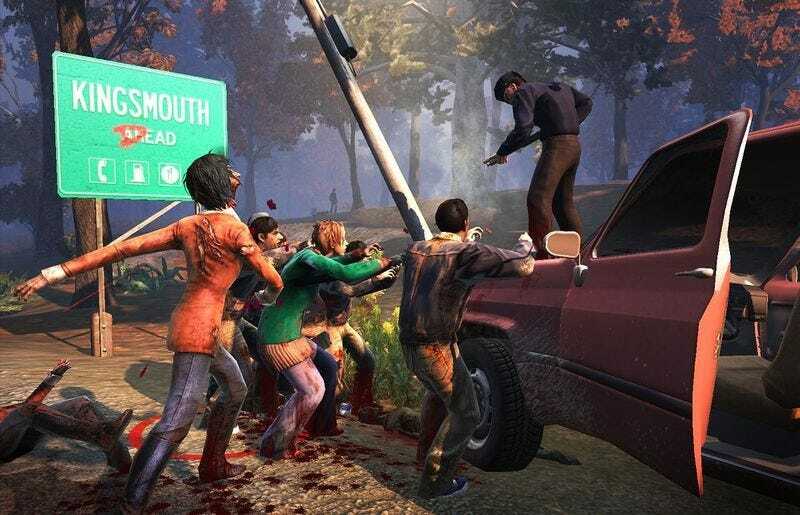 While The Secret World kicks off with players starting in modern day versions of London, New York and Seoul, Korea, the bit I saw of the game earlier this month took place in the fictional New England town of Kingsmouth. In The Secret World each location has what the game developers call its own "monster ecology" based on the mythology and lore of the area. It is a world, the developers tell me, heavily inspired by Edgar Allan Poe, Stephen King and H.P Lovecraft. In the case of Kingsmouth, a sizable island town off the coast of Maine, evil seems very nautically themed. There are zombies coming up out of the ground and walking out of the ocean, hulking creatures that look a bit like something you'd see in Left 4 Dead, possessed machinery and nasty sea creatures. While folk tales and mythology help to shape the enemies you will face in an area, the bigger point of The Secret World is to tell a story that players become engrossed in and try to figure out. "Digging deeper is really what our story is about," said Martin Harsheim Bruusgaard, lead designer for the game." Stories and MMO RPGs traditionally don't play well together. There has always been a conflict between the game mechanics in a way and telling a story and the perception seems that it is not possible. I think what Bioware is doing with The Old Republic and what we're doing with this game could change that. "Our game is a very fertile playground for telling a story. It's a vast open playground for going around and being able to pick up these little jigsaw pieces and put them together on this giant canvas and try to figure out what this story is really about." Funcom's approach to the game allowed them to create hundreds of fully-voiced characters, Bruusgaard said. All of The Secret World's missions are introduced with full cinematics as well. "Stories are the important part of the game for us," said Ragnar Tornquist, the game's creative director. "It feels really nice to have a purpose in the game world. In some MMOS you're running around meeting random NPC number 37 and have to bring them some fish. It's so much cooler to establish this relationship between the player character and the NPC and you're learning about the relationships between the other NPCs. You become part of this group and try to help them out." Instead of worrying about leveling up your character in The Secret World, the big push is to unravel the game's greater mystery and try to find increasingly powerful weapons. You also have a number of occult-like powers you can use, all of which automatically scale with the items you find. While the game has hundreds of powers that can be used, a player can only use 14 at a time - seven active and seven passive. Those abilities can be switched out at certain special locations, the team told me, allowing you to constantly adjust and customize how the character you are playing fights. In one battle I witnessed involving four players against a giant junkyard man, one of the players was using an assault weapon, another stayed in the back healing, a third shot fire from his hands and a fourth used a flaming sword. Bruusgaard pointed out that powers can combine to create new effects, even powers from two different players. This is done by allowing some powers to put friendly or enemy characters in special "states." For instance, a player set an enemy on fire, putting it in the fire state, then another nearby character used a passive power which made the enemy explode as it died, showering nearby enemies with damage-inducing chunks of flaming enemy flesh. Because the game has no levels, the game designers had to come up with other ways to keep players interested in playing the game. That includes all of those powers, weapons and clothing and what they think is a much closer attention to detail in creating the world and the stories that drive it. While the title as a whole isn't meant to be a psychologically frightening game, there are moments that are meant to scare. "When you are out in the open world with hundreds of people it can't be psychologically scary," Bruusgaard said. "When you go into dungeons and four player instances we have a more scripted experience. We use sound and scripting to create a more frightening experience. "I dont think you can have an MMO that is constantly psychologically scary, because that's emotionally draining and to do that for hours and hours would be terrifying." While a release date for The Secret World hasn't yet been set, the team did drop this teaser trailer on me which seems to indicate we'll be learning even more about the game later this week.